Hospitals, Long Term Care facilities, Surgery Centers and Clinics can bring the warm appearance of wood to their treatment and other procedure carts with Harloff’s WV line of vinyl-coated aluminum carts. Designed and built to support culture change initiatives, this cart gives the buyer the best of both worlds, combining the aesthetics of wood with the long-term functionality of a Harloff metal cart. Harloff products were purpose designed to meet industry standards for security and function. 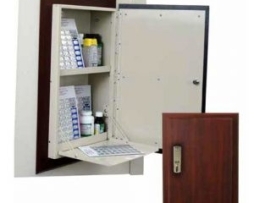 Our in room medication cabinets include slam locks needed for a one hand open and close and drop down shelves that provide work areas. 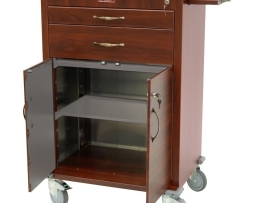 The wood vinyl and wood laminate style medication carts look like a piece of furniture but have the internal design and locking system to meet the demands of Long Term Care use. 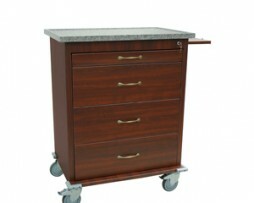 Harloff WV294BOX-DC Wood Vinyl Aluminum Unit Dose Medication Cart Wood Look Vinyl Coated, Capacity of 294 Boxes. 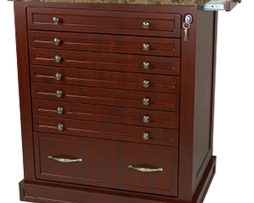 Keylocking Cabinet. Dark Cherry Cabinet Finish and Brown Granite Top Finish. 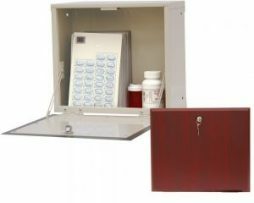 Includes Pull-out Shelf, Drawer Dividers, and Internal Locking Narcotics Box. 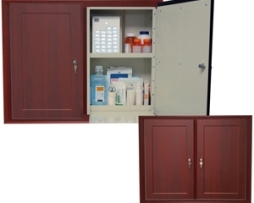 Harloff WL2790-DC Wooden Laminate Medication Cabinet Wood Look In Room Medication Cabinet (21″ Width) with Slam Lock, Dark Cherry Door Finish. Drop Down Shelf. Exterior Wall Mount Cabinet Designed for Double Stud Mounting on 16″ Centers, Hardware Included. Designed to Hold Medications, Liquid Storage and Treatment Supplies. DOES NOT INCLUDE TRIM PACKAGE. 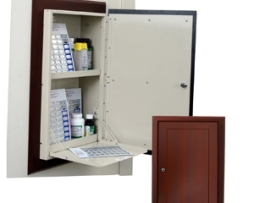 Harloff WL2786-DC Wooden Laminate Wall Medication Cabinet Wood Look In Room Medication Cabinet, Single Door with Dark Cherry Finish, Single Lock – One Hand Open & Close. Designed for in Wall Mounting Between Woden Studs with 16″ Centers, Hardware Included. Capacity of 20 Punch Cards/Liquid Storage for 1 Resident. Door Drops Down To Create Work Area. THIS UNIT DOES NOT INCLUDE MATCHING WOOD TRIM. 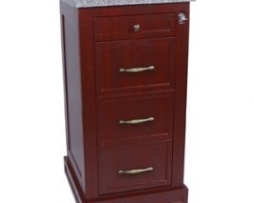 Harloff WL2717-DC Wooden Laminate Medication Cabinet Wood Look In-Room Medication Cabinet, Dark Cherry Door Finish, Single Door, Single Lock – One Hand Open & Close. Wall Mount Cabinet Designed for Stud Mounting on 16″ Centers, Hardware Included. Capacity of 40 Punch cards and Liquid Storage for 1-2 Residents. Door Drops Open For Work Area. DEPTH FOR THIS UNIT IS 11.0″. 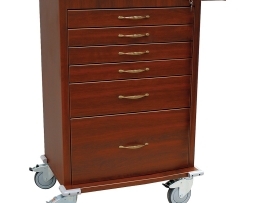 Harloff WV6450-CM Aluminum Wood Vinyl Treatment Cart, Key Lock, 4-3″, 1-6″, and 1-12″ Drawers. Cherry Mahogany with Brown Granite Top. Standard Package Includes Painted Interior Drawers, Pull-Out Side Shelf. Harloff WV6200-CM Wood Look Vinyl Coated Aluminum Treatment Cart, Standard Package, 1-3″, 1-6″ Drawers, and 1-21″ Storage Compartment with Adjustable Shelf. Cherry Mahogany with Gray Granite Top. Standard Package Includes Painted Interior Drawers, Pull-Out Side Shelf. 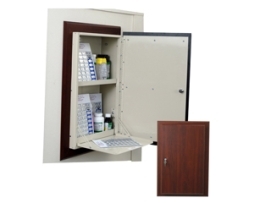 Harloff WL2784ETRMPKG-DC Wooden Laminate Wall Medication Cabinet has a Wood Look In Room Medication Cabinet with Basic Electronic Pushbutton Lock, User and Supervisor Code Provided. Dark Cherry Door Finish. Drop Down Shelf. Designed for In Wall Mounting Between Wooden Studs with 16″ Centers, Hardware Included. Capacity of 40 Punch Cards and Liquid Storage for 1-2 Residents. INCLUDES TRIM PACKAGE. The Door on This Cabinet Will Swing Open to the Right. Harloff WV600PC-CM Wood Vinyl Punch Cards Medication Cart with BEST® Lock on Cabinet, Capacity of 600 Cards, Cherry Mahogany Cabinet Finish with Brown Granite Finish on Top. 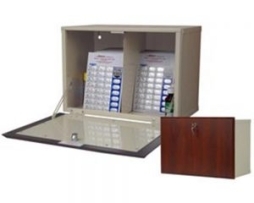 Standard Package Includes Full Skirt, Pull-out Shelf, Adjustable Punch Card Row Dividers. 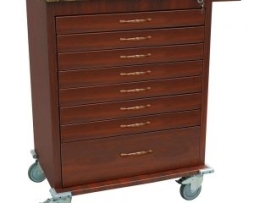 Dual Column Cart – Single Wide Narcotics Drawer. 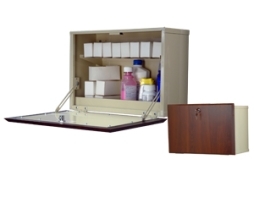 Harloff WL294BOX-DC Wood Laminate 294 Unit Dose Medication Cart with a Capacity of 294 Boxes. BEST® Lock on Cabinet. 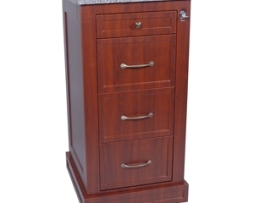 Dark Cherry Cabinet Finish and Grey Granite Top Finish. Includes Pull-out Shelf, Drawer Dividers, and Internal Locking Narcotics Box. 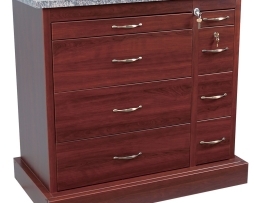 Harloff WL2780MRTRM-DC Wood Look Wall Medication Cabinet included a recessed door front with Mirror Attached, Dark Cherry Door Finish. Single Door, Single Lock – One Hand Open & Close, Drop Down Shelf. Designed for In Wall Mounting Between Wooden Studs with 16″ Centers, Hardware Included. Capacity of 40 Punchcards and Liquid Storage for 1-2 Residents. INCLUDES TRIM PACKAGE. The Door On This Cabinet Will Swing Open to the Right. 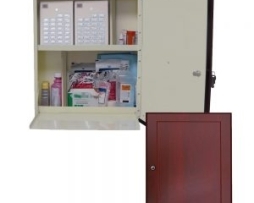 Harloff WL108BOX-DC Wood Laminate Unit-Dose Box Medication Cart (Narrow Cabinet), Capacity of 108 Boxes, BEST® Lock on Cabinet. 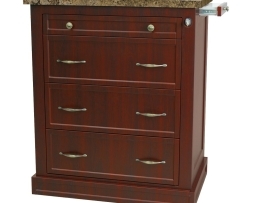 Dark Cherry Cabinet Finish and Brown Granite Top Finish. Includes Drawer Dividers and Internal Locking Narcotics Box. 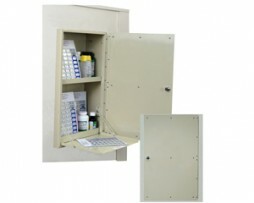 Harloff WL2781 Single Door Wall Medication Cabinet with Slam Lock. Single Lock – One Hand Open & Close, Drop Down Shelf. Designed for In Wall Mounting Between Wooden Studs with 16″ Centers, Hardware Included. Capacity of 40 Punch Cards and Liquid Storage for 1-2 Residents. Metal Door Pre-drilled to Accomodate Customer Supplied Wood Door. WOOD DOOR AND TRIM NOT INCLUDED. The Door On This Cabinet Will Swing Open To the Right.